Dubai, 31/03/2019 – For the second time in less than a week, Dubai’s International Humanitarian City (IHC) has dispatched a cargo flight made available by His Highness Sheikh Mohammed bin Rashid Al Maktoum, Vice-President and Prime Minister of the UAE and Ruler of Dubai, a Boeing 747, to deliver badly needed humanitarian aid to victims of Cyclone Idai. 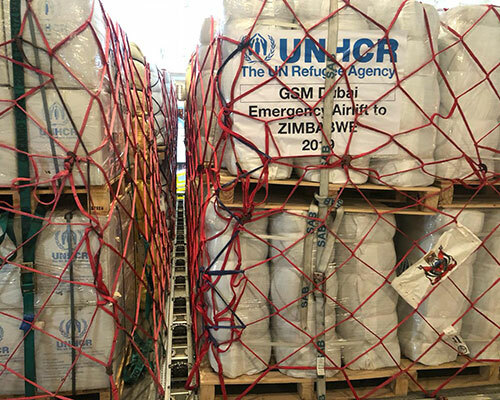 The Zimbabwe-bound flight carried 100 metric tonnes of much-needed supplies provided by the United Nations High Commissioner for Refugees (UNHCR) to help about 10,000 individuals meet basic survival needs. On board were jerry cans, mosquito nets, mats, blankets, tents, buckets, kitchen sets, solar lamps, and vehicles. This is the sixth airlift operated by the IHC destined to southern Africa where nearly three million people require urgent aid after the tropical storm Idai ravaged the region. Thus far, the IHC has airlifted approximately 550 metric tonnes of relief items from the global stockpiles of its members and partners in Dubai, including a consignment of 91 metric tonnes donated by the UAE Ministry of Foreign Affairs and Cooperation to provide Ready-to-Use Supplementary Food (RUSF) to treat 15,000 children suffering from moderate acute malnutrition in Mozambique. Idai is now the third-deadliest tropical cyclone on record. The death toll from the storm, which smashed into Mozambican port city of Beira two weeks ago and spread to Zimbabwe and Malawi, has now risen to 746. Many of the missing are feared dead with malnutrition and disease expected to claim hundreds of more lives over the next six months.